Patti Hobbs is a Certified Genealogist® with a BA in biology. She works as a professional genealogist and occasionally at the Springfield-Greene County Library. Instructing on the use and analysis of DNA testing and how it complements traditional research in original records; Patti has taught classes for the Genealogical Research Institute of Pittsburgh, Missouri State Genealogical Association, San Antonio Historical and Genealogical Society, and the North Carolina Genealogical Society. Patti is also an active member and the head of the Education Committee of the Ozarks Genealogical Society. President Dale Schmidt retired after 35 years with the Missouri State Highway Patrol. He began his career in Troop A, Kansas City and served at Troop C, St. Louis, Troop F, Jefferson City and the last four years was Major of the Support Services Bureau on the Superintendent’ staff. After retirement he was selected as the Executive Director of the Missouri Peace Officers Association and continues to serve in that position. He has a Bachelor of Science degree from the University of Central Missouri. He is a graduate of the FBI National Academy, Quantico, Virginia; Northwestern University’s School of Police Staff and Command, Evanston, Illinois; and the FBI’s Law Enforcement Executive Development School. President Schmidt is a member and deacon at Concord Baptist Church and former vice-president of the Concord Christian School Board. He is a member and previously served as president of the Eastern Missouri Chapter of the FBI National Academy Associates. He currently serves as secretary on the Highway Alliance Credit Union. He has been a member of the Christopher Casey Chapter since December 20, 2005. 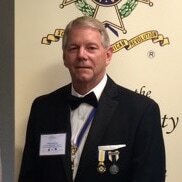 He serves on the NSSAR Public Service and Heroism Committee, as MOSSAR chair of the Knight Essay Contest and past president of the Christopher Casey Chapter. President Schmidt has been married 37 years to his wife Debbie and they have one son Grant and daughter-in-law Meghan and a grandson to be born this spring. Larry Guzy serves as the Secretary General NSSAR. He maintains the official records of the activities of the Executive Committee, Trustees, and national SAR Congresses. He coordinates with the SAR Headquarters’ staff on compiling the officer and committee reports for distribution at meetings and also oversees the notices for scheduled meetings along with meeting registrations. Compatriot Guzy was born and raised in St. Louis, Missouri, and graduated from Jesuit High School in 1966. He later graduated from Jesuit Marquette University in 1970 with a Bachelor of Science degree in mathematics. Compatriot Guzy served three years in the U.S. Navy on the USS Independence aircraft carrier. In 1973, he and his wife, Karin, moved to Marietta, Georgia. He was self-employed in an insurance claims handling business for 40 years, retiring in 2013. In 1995, he joined the Georgia SAR and took his first steps into involvement at the National level in 1999. ​Clif Smart has served as the 11th president of Missouri State University since June 27, 2011. Missouri State University has demonstrated significant progress under Smart’s leadership including setting new enrollment records each year, increasing total enrollment, increasing the number of underrepresented students, and the number of international students. Missouri State has implemented fifteen new degree programs, two of which are doctorate programs. The University has achieved a Silver STARS rating from the Association for the Advancement of Sustainability in Higher Education and constructed or extensively renovated more than a dozen major campus facilities. The university has also received a historic level of external support, setting records in state appropriations, private gifts and grant funding. Smart is committed to college affordability. Under his leadership, the university has raised tuition by less than the amount of inflation, meaning it is less expensive to attend Missouri State now than when Smart first became president. Smart is known throughout campus and the state of Missouri for his collaborative leadership and strong relationships with students, faculty and staff. Having lived in Missouri for more than two decades, Smart maintains strong ties with leaders throughout the state and is actively engaged in the local community. Smart currently serves as the president of the Council on Public Higher Education in Missouri and recently served on the NCAA Division I Board of Directors. He has also served on boards and committees for the Missouri Department of Higher Education, Springfield Area Chamber of Commerce, CoxHealth, Arc of the Ozarks, Springfield Innovations, Inc., Isabel’s House, First Baptist Church and numerous other professional and community organizations. Before his presidency, Smart served as the Missouri State University’s general counsel. Before coming to Missouri State University, Smart had a private legal practice in Springfield, Missouri. Smart lives in Springfield, Missouri, with his wife, Gail.